Clair Challenor-Chadwick, MD of Cause UK organised a media launch on 04 May 2016 for Leeds artist and performer Mik Artistic generating coverage on BBC Look North, BBC Radio Leeds, the Yorkshire Reporter, The Star, Yorkshire Post , Yorkshire Evening Post and Made in Leeds TV. Take a look at Mik Artistic’s exhibition at Besbrode Pianos with this amazing 360 degree photo. 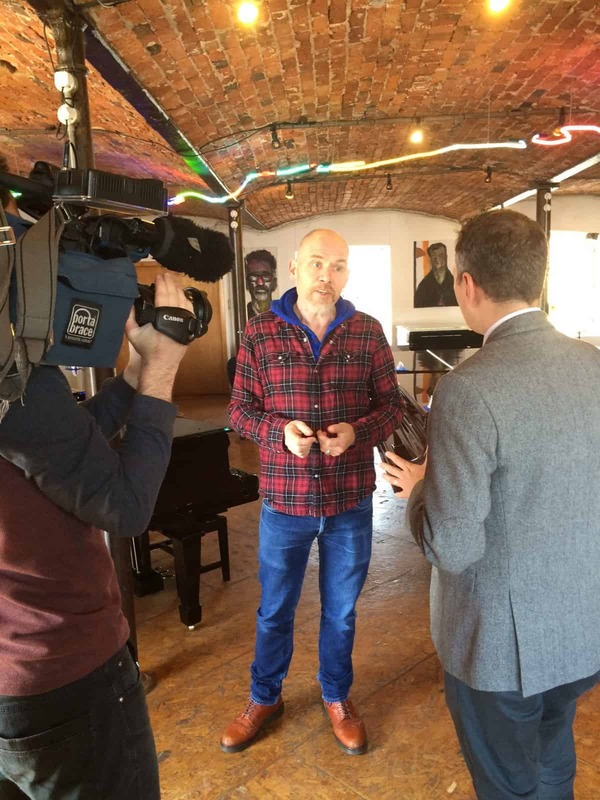 Leeds artist and performer Mik Artistik showcases a series of portraits in mixed media, of Leeds people, at Besbrode Pianos in Holbeck, from the 6th May – 6th June, free to the general public, 10am-4pm, 39 Holbeck Lane, Leeds, LS11 9UL. Mik’s portraits are of 15 strangers he has seen time and again around Leeds at gigs, cinema queues and parties. Mik describes his subjects as “my magic people of Leeds, cheery sparks and crackly characters” who through chance encounters have intrigued Mik over the years. These large impressive canvasses stand as social documentary of a cross-section of Leeds society and will be showcased for a month-long free exhibition, at Besbrode Pianos, an imposing four storey Victorian mill in Holbeck, which is a stunning showroom for 250 antique and modern pianos. A regular at Glastonbury, Mik Artistik is also a musician, comedian, writer and performance poet, you are invited to meet Mik at a special exhibition preview and music event on 6th May 6.30pm-9.00pm. Mik Artistik is a Leeds-based artist, musician, comedian, writer and performance poet. He graduated from Bradford College and, despite these other artistic outlets, describes painting as his original passion. Mik Artistik has exhibited extensively throughout his career, including Leeds, Bradford, Wakefield, Newcastle and London. 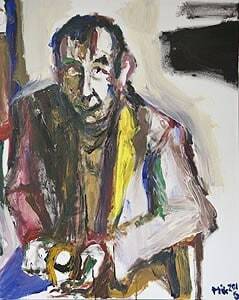 He has exhibited a selection of large oil paintings at the Playhouse, Bradford, and in 2003 exhibited a self-portrait at the National Portrait Gallery, London. Artistik also writes songs about his world, performing them with his band “Mik Artistik’s Ego Trip” with Jonny Flockton on guitar, Benson Walker on bass and Mik on mic and keyboards. Mik Artistik’s Ego Trip has drawn enthusiastic crowds at Glastonbury, Latitude, Leeds, Port Elliot Festival’s and bars and clubs throughout the North of England.